The System Info interface asset enables you to retrieve information about the device running your experience. 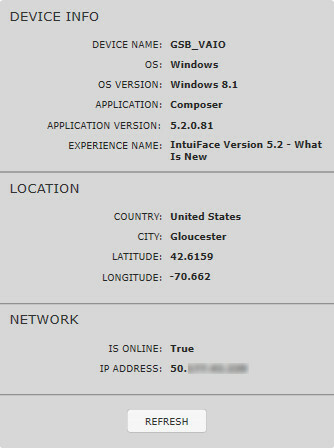 It can be the computer on which you are running Intuiface Composer or any device on which Intuiface Player is running an experience. 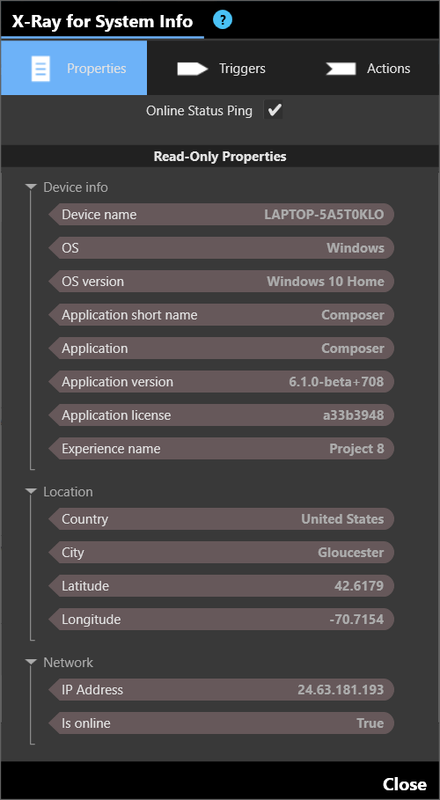 The information includes data about the device itself, the network, the network status, and the geographic location (derived from the IP address) of that device. Online status ping toggle whether the Intuiface experience should monitor the status of Internet connectivity. This monitor checks the Internet status every 60 seconds. When there is a change in status from the previous check, the appropriate trigger - Is online and Is offline, noted below - is raised. A typical use of this feature would be to post an onscreen warning when the network is down. For Chrome, the value is always "PlayerChromeOS"
For LG webOS, the value is always "LG webOS"
Is back online: Raised by the Online status ping when the current network state is "online" and the previous network state was "offline". Will also be raised by the very first Online status ping when an experience is started and the device is online. 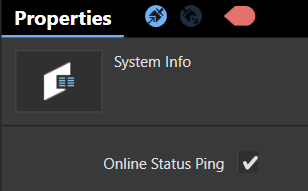 Has gone offline: Raised by the Online status ping when the current network state is "offline" and the previous network state was "online". Will also be raised by the very first Online status ping when an experience is started and the device is offline. Set online status ping: toggle whether the Intuiface experience should monitor the status of Internet connectivity. For more information, see this section above. Refresh: Call this action to refresh all the properties mentioned above. 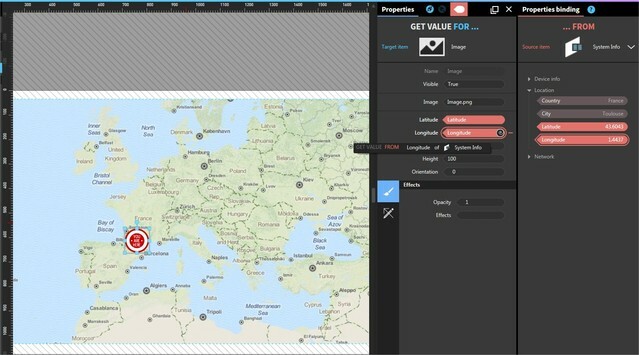 In a scenario where you are deploying an experience to multiple geographic locations, you can display the location of an active user (in a city for example) using the Map collection and a pinpoint image. Bind the latitude and longitude properties of the pinpoint image to the latitude & longitude values retrieved by the System Info interface asset. The resulting Intuiface experience will correctly position the pinpoint image on all devices even if their locations varied widely. Imagine that for an event you will be running an experience on multiple devices. Assume each device needs to show slightly different content. Also assume your content is referenced in an Excel spreadsheet. Assign each device a helpful, unique name - don't call them all "My PC" - and add a "Device" column in your Excel file. When starting your experience, filter the Excel spreadsheet based on the device name retrieved by the use the System Info interface asset. The result is that each experience can customize itself.